This is downhill. The real deal, for two weeks only the keyboard warriors will slink away from the clavier, curl up their powerful pinkies and maybe, just maybe sit back in awe of all things DH. Drooling over the “pit-bits” photos, living dangerously vicariously through the practice days RAW footage all building towards the Red Bull T.V. climax on the Saturday! Val di Sole and Vallnord, big, wild, natural and gnarly. “Proper” DH tracks some will say, rightly so as many others will agree but that’s not quite enough to truly grasp the challenge of winning on either of the next two venues race tracks! Val di Sole’s “black snake” race track is just over 2km in length and drops 548m, doing so at a very constant gradient, apart from the start and finish run in the track snakes it’s way down the hill in an often fuss free direct manner, steep, wild and requiring full attention at all times. The punishment dished out by the big impacts is made worse by the constant steepness, a gradient that requires a fine balance of holding your upper body in a stable posture, supported by your legs but always finely adjusting weight distribution to hit your lines, maintain traction and pound the key pockets on track that allow you to change direction, brake and do the fatest job possible. Mixing those upper body demands that see the riders hit instantaneous double G figures with the need to brake quite often but VERY precisely means hand, arm and leg fatigue are rife in practice and racing. It is as specific as fatigue gets so a healthy body, quality conditioninging program in the past weeks and months and some smart & timely recovery strategies throughout practice are key. Basically the black snake requires relaxed, precious and powerful riding, directness pays massive in time gained but it comes at a heavy price. Payhed for in physical ability and mental acuity! In contrast, Vallnord’s WC DH Track dropping 643m from La Pal ski resort to the town of La Massana does so over a longer 2.5km! That extra length and the logistics of crossing a road with a bridge and bringing the finish line to the “town” means Andorra’s track has much more variety in terrain, soil and gradient than the VDS beast. Still a true “natural” challenge, Vallnord’s track has a flat, flowing top, some high speed tech and then eventually after some high speed hits, berms for the TV and rocky off-cambers it “breaks”! A very marked change in gradient that often sees the beginning of where the race is won or lost. Some riders seem to “reset” finding better flow, feel or less fatigue on the steeper bottom third of the track. Others crumble under the duress or just don’t handle the distinct change in rhythm too well. Bike set-up, accumulated fatigue, mind-set, pacing, tactics or strategy. Vallnord could be seen as just as much if not more of a “challenge” than Val Di sole… the reality being though, as I’ve waffled about before…it’s just different! Everything changes but everything stays the same? 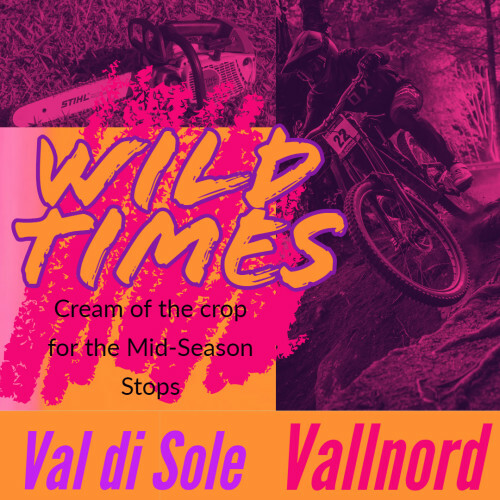 Well 2018 see’s the VDS race hitting the Valley of the sun in early July – prime thunderstorm season, and as I sit here in Val di Sole finishing off this waffle it is raining heavy outside, it’s still a toasty 24c but it ain’t gonna be the dust on dust race we’ve had for out previous 4 visits. Trackwalk will tell the tale but there’s been talk of a few small changes to the bottom half of this classic track. With safety and spectacle in mind. Taping width and direction have been decisive here in the past with the 2017 race having one of the best mixes of speed, challenge and technicality in many many years, all made possible by simply taping in a wide track that allows the riders to use the hill to both generate and scrub speed as needed. Andorra is a week away yet and I’m sure there are those in “the know”, rumours are a brand new bottom section of track being used, possibly negate the chat above about the big break in gradient. But for now sticking with the known knowns is all we can do! 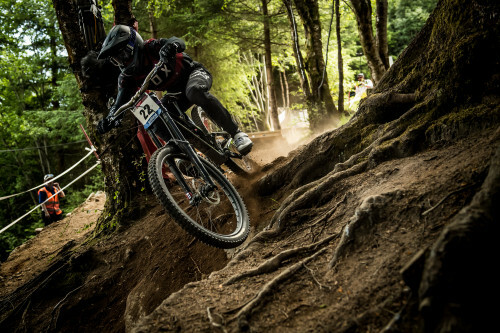 Fingers crossed for as much fresh track, fresh challenge and fresh dirt as possible. As natural as Vallnord is, it’s a well used hill, with many years of world cup racing and seasons of bike park useage under its belt the track is down to bedrock in places meaning “lines” don’t come with choice. Anyways, from here on in it’s track-walk, practice, quali and finals. Same old, same old. Make sure to tune into Instagram to see the same adjectives used daily, wild, rough, gnarly, natural etc… Friday night you’ll see “time to turn it up” or “bring the heat”. We are halfway through the season almost, the top dogs are pretty set, the top 20 contenders even, but what’s not too clear is who’s gonna take control in the overall, the men’s race is so tight, the women’s too. Seagrave’s DSQ in Leogang sees here 174 pts back, the mens race doesn’t quite have that issue other than Gwin’s crash in Fort Bill. 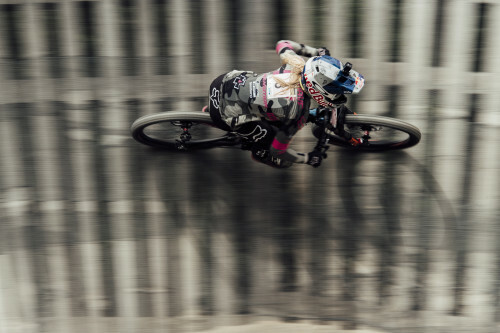 Rad race tracks for rad riders. Here’s hoping for some wild weather and a good shake up in who from the top 20 men make it into the top 10 or even the podium. Make sure you tune into Red Bull TV, more support, more views = more races.